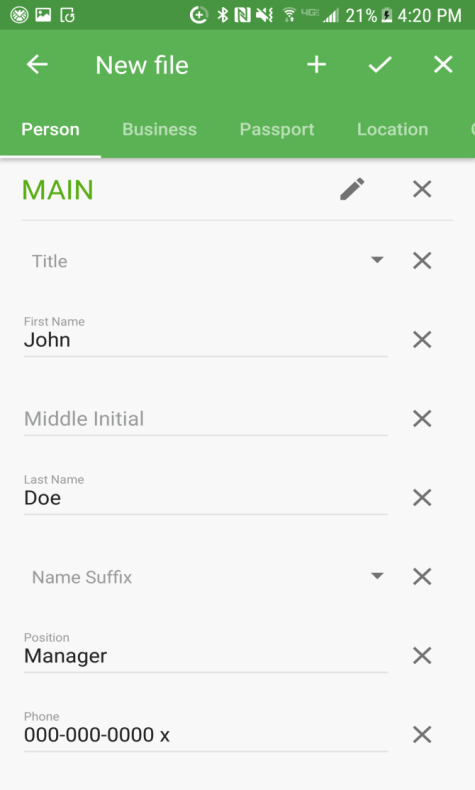 Requirements RoboForm is compatible with Android 4.1.3 and above. Click Install and wait for the download to finish. 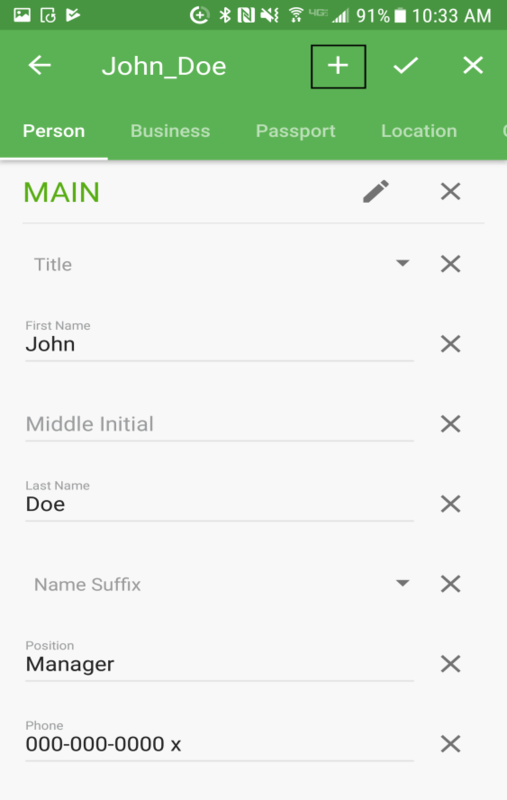 Your RoboForm application will appear on your Android device’s Apps page. Launch the application by clicking the RoboForm application. On the Welcome page of the app, you have a couple of options for Account Setup. 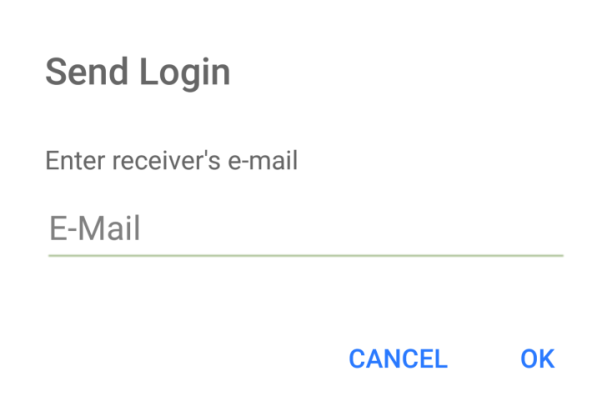 You can Sign In with an existing RoboForm account by typing in your User ID and Account Password (if you’re using version 7) or Email and Master Password (if you're using version 8). Enter your E-Mail, Master Password, confirm your Master Password, and your Name. For your Master Password, a shield will appear with a rating of your Password Strength. In order to achieve a Strong rating, create a unique and complex password. It is very important that you memorize your Master Password. If you are an Enterprise User, select the three dots in the upper right corner and select Advanced to show the Custom Everywhere Server fields. 4-digit Pin is a four digit numerical code to unlock the RoboForm app. Touch ID lets you use your fingerprint to unlock the RoboForm app. Master Password is a password to unlock all your other passwords. If you are a returning user, it will use the Master Password you already use on your desktop. Look through the secure methods of accessing your RoboForm application and select which method you would like to use. Your RoboForm application is now set up. 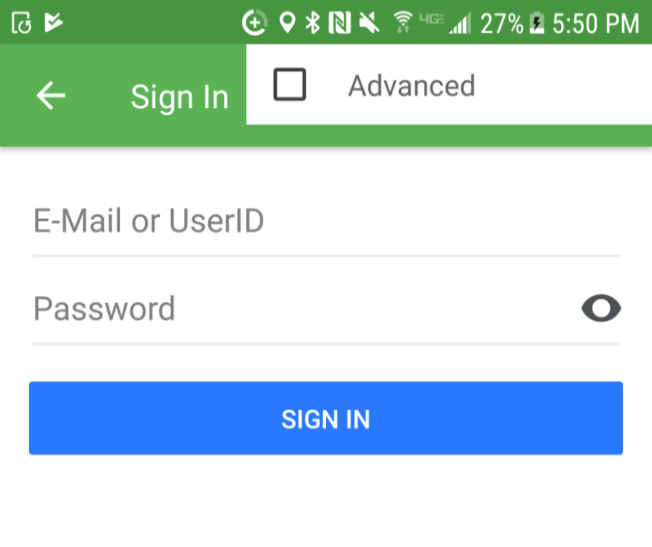 Login RoboForm saves online passwords into what we call a Login. RoboForm will offer to fill your Login details automatically when you visit the login page again. Bookmarks Bookmarks are websites and web pages you can save to RoboForm, similar to a Bookmark in your browser. Bookmarks leave you one click away from your favorite web pages. Identity Your Identity is your personal profile. RoboForm can automatically fill in long non-password forms, such as an online checkout form, with your Identity. Contact This is your Address Book, each entry in this Address Book is called a Contact. A Contact is like an Identity but is not used for form filling. Instead, it is used to lookup other people’s personal data such as their name, phone number, address, etc. Safenote You can store frequently-used text into what we call a Safenote. 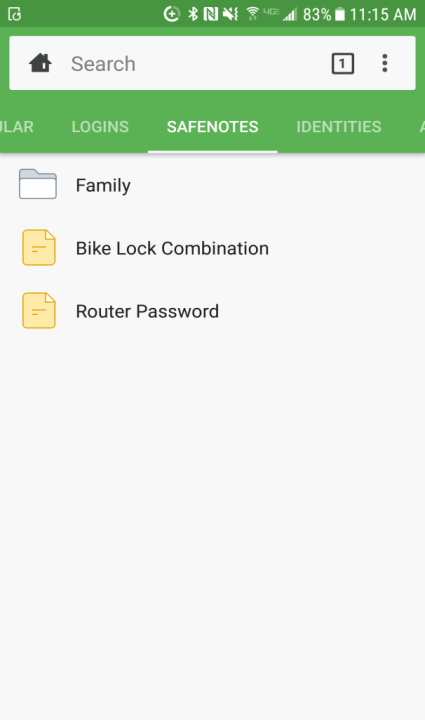 Safenotes provide storage for important information that is not automatically stored in Logins or Identities such as lock key combinations, secret family recipes, and software activation codes. RoboForm Data All of your RoboForm Items - your Logins, Bookmarks, Identities, Contacts, and Safenotes - make up your RoboForm Data. Folder All of your RoboForm Items can be categorized in Folders, similar to Windows Folders. Any file of RoboForm Data can be organized into Folders - including other Folders! Master Password This is the main password that unlocks all of your RoboForm Data. Do not forget your Master Password! Start Page This is the main page of the RoboForm application that allows you to view and edit your RoboForm Data. RoboForm Web Browser This is the browser within the RoboForm application. You are able to save, fill, and submit forms within the RoboForm Browser. Menu Button This three dotted button opens Matching Logins, Identities, and Contacts when you are using the RoboForm Browser. Matching Login In the Menu Button, Matching Login finds which Login is the best fit for the web page you are visiting. Preferences This menu holds many RoboForm options and features such as Sharing, Security Center, and Emergency Access. Save Prompt This is the screen that allows you to save RoboForm Logins and Bookmarks in the application. Use Logins to store data that is specific to a web site; data such as Usernames, Passwords, Survey fields, etc. Essentially, you can save any form data to Logins and use it to automatically fill any form later. 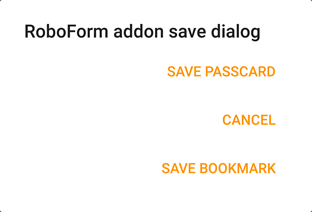 When you manually enter login data to a login page and click the Login (Submit) button, RoboForm will offer to save this login info by displaying the Save Screen. Manually login to a website in your RoboForm Web Browser. The Save Screen will open. You can rename the Login name here. The Save Prompt will close and your Login will save. 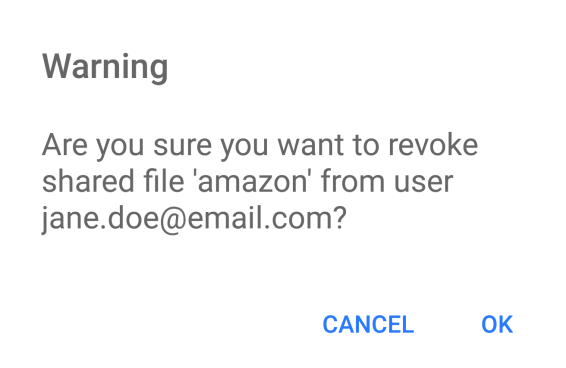 If you try to save a Login that has the same name as an existing Login, you will be shown a warning that says saving the Login will overwrite the data of your existing Login. If the domain is blocked, RoboForm will not ask to save Logins automatically. You can find and remove blocked domains in Settings > Form Filling > No AutoSave for these sites. The Save Screen pops up only if the Login data you entered is New, Different, or Updated. It will not prompt you if the exact same data (E.g. Username & Password) are already saved to RoboForm. RoboForm can save your Username and Password from the page where you create a New Account into a Login. Even though it’s not the exact login page, AutoSave will pop up on your New Account or Registration page. 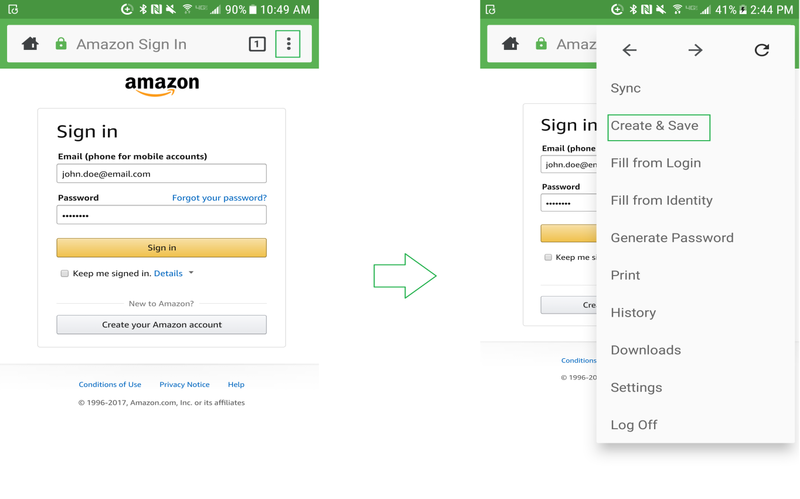 This also works with changing your Password on an existing account; Save Screen will offer to save your new password and overwrite your old password in Logins. On the occasion that the Save Screen doesn’t pop up - because of a blocked domain or the website’s format - you can manually save a Login. Go to the website you want to save a Login for. Type in your Login as normal. Before clicking Submit or Login, click the Menu Button at the top right corner of the screen. A menu will open. Click Create & Save. The Save Screen will close and your Login will be saved. You might have to do a Manual Save of a Login if the website’s login page has been changed or updated. Simply manually login, and on the Save Screen overwrite the original Login. RoboForm can do the entire Login sequence for you. Simply find your Login in the Start Page or the Login Menu, which can be found at the top of the Start Page, and click it. The web page will open in the RoboForm Web Browser and RoboForm will log you in. This is the main menu for viewing, using, and editing Logins. You can select RoboForm Data of a particular type by selecting the corresponding tab. You can create a folder by selecting the Menu button > Create & Save > Folder Folders are shown at the top of the list of your RoboForm Data. After Folders, all of your RoboForm Data is organized alphabetically. 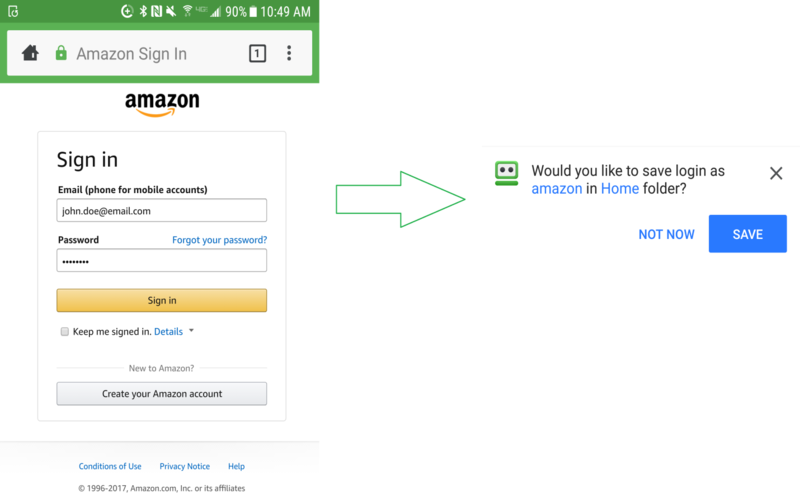 As mentioned earlier, clicking on a Login will automatically open the web page and do the entire Login sequence for you. Show open the Edit Screen for this Login. Login navigate to the website, fill in your username and password, and submit the information. Go To navigate to the website for this Login. Go & Fill navigate to the website and fill in your login information but will not submit it. Sharing prompts you for the email of another RoboForm account to share the Login with. Create shortcut on home screen create a shortcut on the home screen of your Android device to open the Login in the RoboForm Web Browser. Add to/Remove From Favorites adds the Login to or removes if form the Favorites page. Move move this Login into a folder. Rename change the name of this Login. By choosing the Show option you will bring up the Edit Screen for the Login. Clicking the Show Password Button will show your password rather than hiding it behind asterisks. Clicking the Hidden Information Button will reveal all of the meta data that RoboForm has captured. Clicking the Edit Button will allow you to change the Name of the Login, the GotoURL, your Login details (e.g. 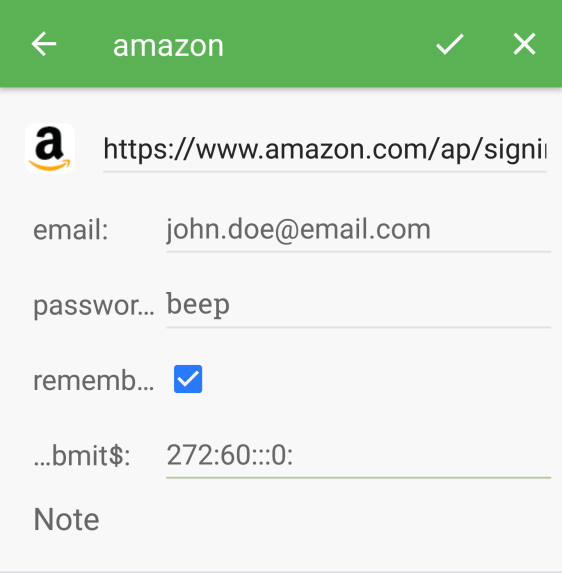 email and password), and add or edit a Note. Click the check in the top right when you are finished editing. The GotoURL is shown at the top of the page. This is the URL that RoboForm will use to find the website’s login page. When you visit a website in the RoboForm Web Browser, the popup screen will show the Login that best matches your website. This is called a Matching Login. If you have multiple Matching Logins, they will all appear in this popup. Simply click the Matching Login to automatically login to the page on the RoboForm Web Browser. Read more about this in Chapter 9: RoboForm Web Browser. 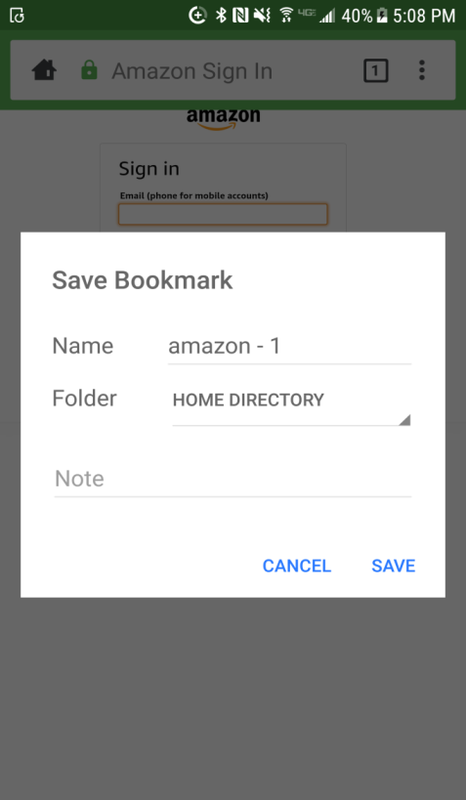 Use Bookmarks to store web addresses (URLs) in order to be a click away from your favorite pages and articles. Go to the web page that you would like to save in the RoboForm Web Browser. Open the Menu button and click Create & Save. In the Create menu select Bookmark. The Save Screen will open. Rename your Bookmark here. The Save Screen will close and your Bookmark will save. 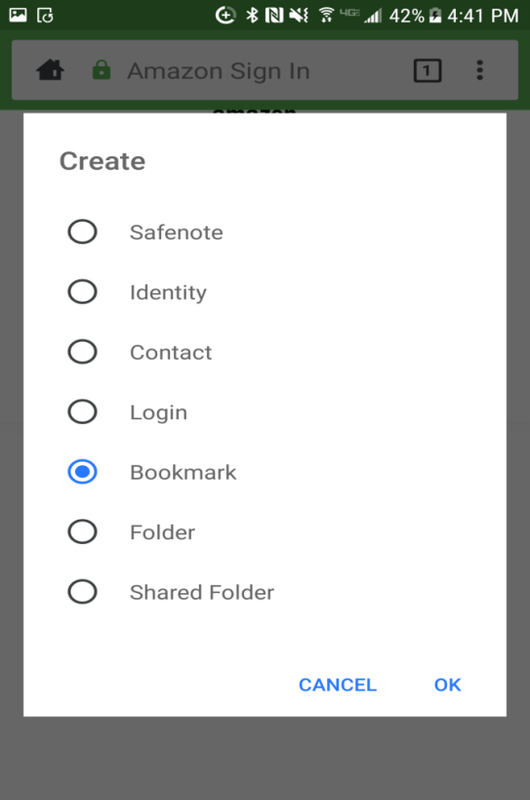 Note: Bookmarks are found in the Logins Menu. The Logins Menu is the main menu for viewing, using, and editing Bookmarks. The menu and its features are explained above in Chapter 3: Logins. Show open the Edit Screen for this Bookmark. Go To navigate to the website for this Bookmark. Sharing prompts you for the email of another RoboForm account to share the Bookmark with. 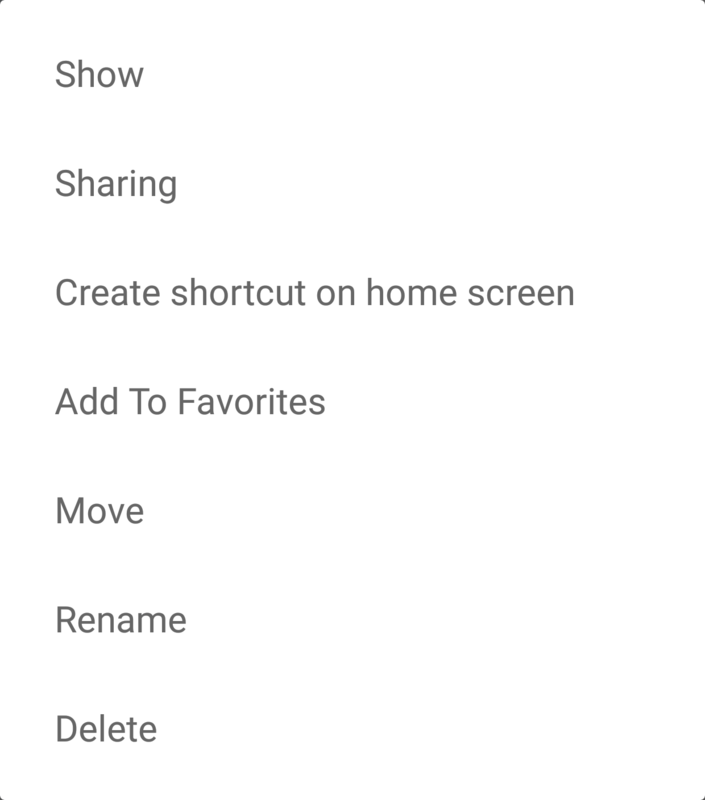 Create shortcut on home screen create a shortcut on the home screen of your Android device to open the Bookmark in the RoboForm Web Browser. Add to/Remove From Favorites adds the Bookmark to or removes if form the Favorites page. Move move this Bookmark into a folder..
Rename change the name of this Bookmark. A GoTo button that will open the bookmark in the RoboForm Web Browser. A Send button that prompts you for the email address of a Roboform account to send this Bookmark to. Read more in Chapter 11: Sharing and Sending. An Edit button. 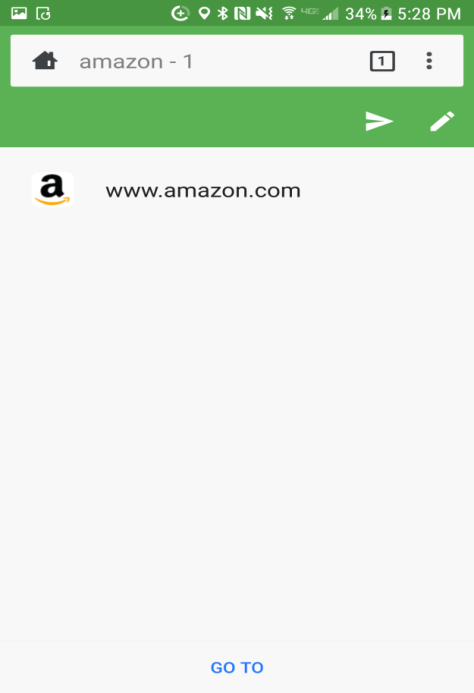 Clicking it will allow you to change the Name of the Bookmark, the GotoURL, and lastly add or edit a Note. Click the check in the top right when you are finished editing the Bookmark. RoboForm can automatically fill long non-password forms (E.g. Online Shopping Checkouts, Sign Up Forms) with information from your Identity, which is like a personal profile. Clicking on an Identity from the Identities menu will open up that Identity and allow you to choose from the Identity Element tabs. Each Identity Element (E.g. Person) is made up of individual Identity Fields (E.g. Phone), or distinct personal details. Clicking on an Identity Element will open the Identity Fields. Person has Identity Fields associated with an individual such as name, date of birth, SSN, phone number, etc. Business is the business entity that the Identity is associated with. Passport is your Identity’s passport. Location is your Identity’s physical location. Credit Card is your Identity’s credit card(s). Bank Account is your Identity’s bank account(s). Car is to store information about your Identity’s car(s). Default Password stores your favorite usernames, passwords, and security questions for creating new accounts. Note: We strongly discourage reusing a password for multiple accounts. Select Create & Save from the Menu button and select Identity. Name your Identity by filling out the name fields. Click the Check to save what you’ve entered. Open your Identity from the Identity menu. Open an Identity Element and click the Edit button to fill out or edit the Identity Fields within. Click the Check when you are finished. If you have more than one credit card, bank account, etc, you can create multiple Identity Elements. Open your Identity from the Identities tab. Click Edit button in the top-right corner. Click the plus button to add a New [Element]. Name your new element and select the other Identity Fields to type into them. Once you are finished entering details, click the Check in the top right corner. Show open the edit menu for this Identity. Sharing prompts you for the email of another RoboForm account to share this Identity with. 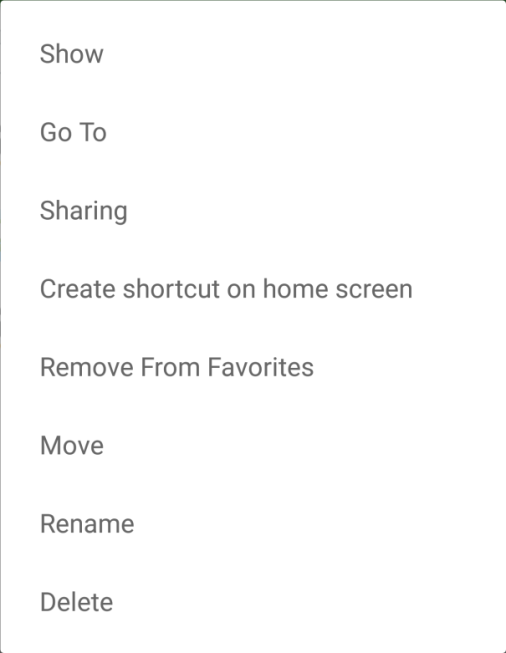 Create shortcut on home screen create a shortcut on the home screen of your Android device to open the Identity. Add to/Remove From Favorites adds the Identity to or removes if form the Favorites page. Move move this Identity into a folder. Go to the form you would like to fill in the RoboForm Web Browser. For example, a form could be an online shopping checkout or an account sign up page. Click Fill Empty Fields only if you only want the empty fields to be filled. Your forms will be filled in the RoboForm Web Browser. Contacts are similar to a phone-book. Store an individual’s contact information here. 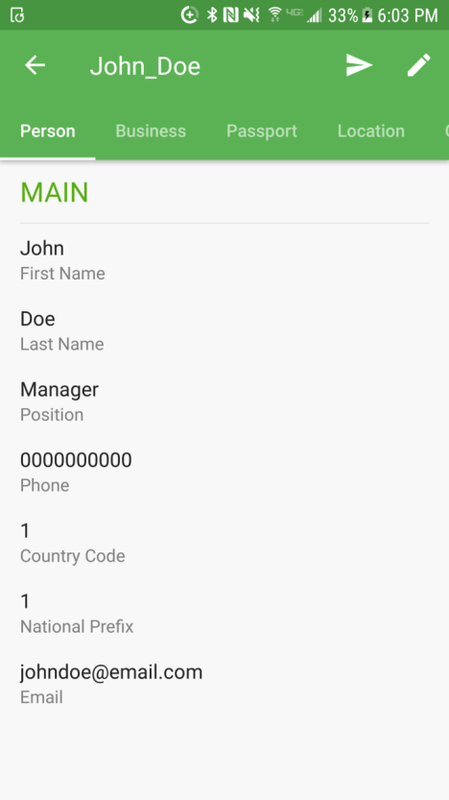 In the mobile application, Contacts are in the Identity Menu and are created and edited the same way as Identities. Each Contact is composed of Contact Elements (Person, Business, etc. ), and each Contact Element is made of individual Contact Fields (Phone Number). Unlike Identities, Contacts cannot be used to fill forms. Your main tool for creating, viewing, and editing Safenotes is the Safenotes Menu at the top of the Start Page. Select Menu Button in the top right corner. Click Create & Save and select Safenote. Enter the text of your Safenote underneath the name. Click the Check in the top right once you’re finished. View Safenotes by opening them from the Safenote Menu. Edit Safenotes by clicking Edit button when the Safenote is opened. Type directly into the text. The font size can by altered by clicking the Text button. 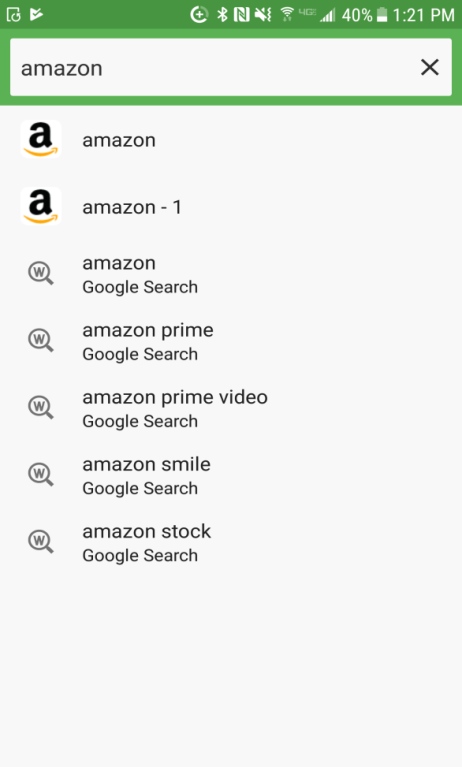 You can search though a Safenote using certain terms by selecting the Search button. Show open the edit menu for this Safenote. Sharing prompts you for the email of another RoboForm account to share the Safenote with. Create shortcut on home screen create a shortcut on the home screen of your Android device to open the Safenote. Add to/Remove From Favorites adds the Safenote to or removes if form the Favorites page. Move move this Safenote into a folder. 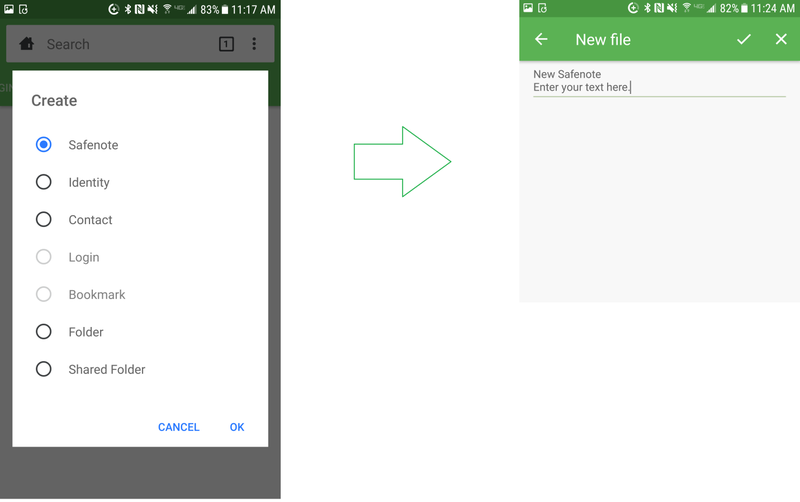 Rename change the name of this Safenote. The RoboForm Start Page is the main tool for viewing and using RoboForm on the RoboForm Android Mobile application. 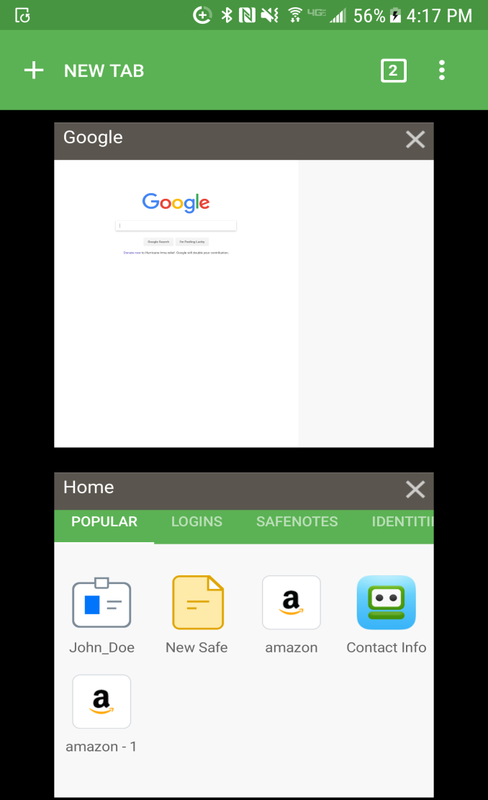 At the top of the Start Page is the Upper Toolbar that is visible on every page, besides the Preferences menu, of the RoboForm app. 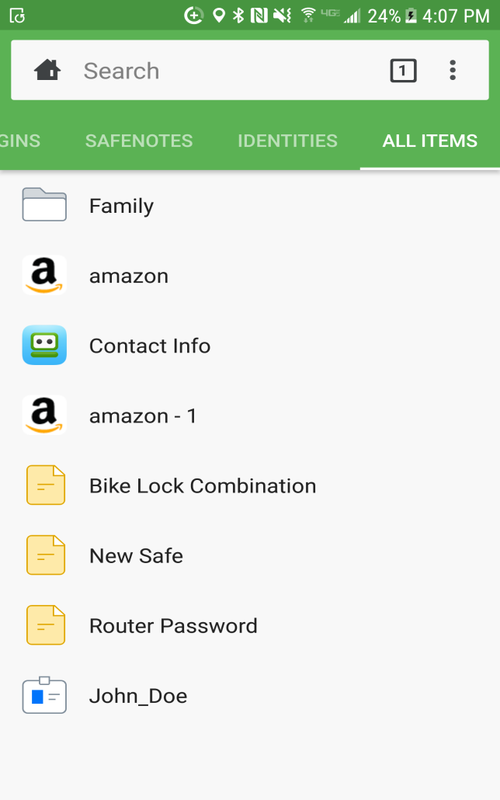 The Home Icon will take you back to the Start Page from whatever page you are on. Search is a search box for your RoboForm Data and also the RoboForm Web Browser. Read more in Chapter 9: RoboForm Web Browser. The Page Icon allows you to open, close, and pick which tab to use in the RoboForm Web Browser. Read more in Chapter 9: RoboForm Web Browser. 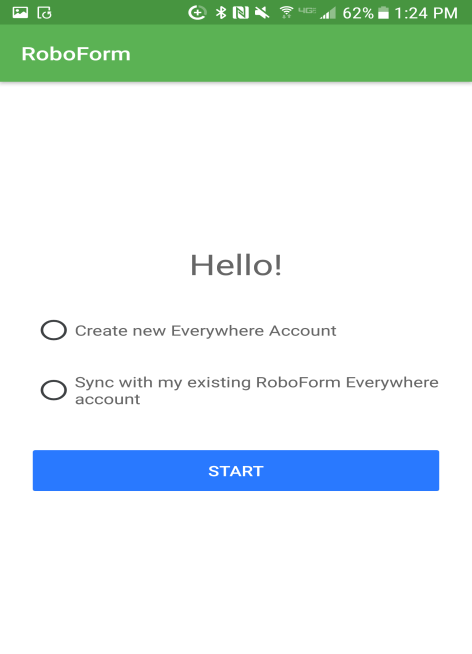 Sync will sync your RoboForm data with your RoboForm Everywhere account. Create & Save allows you to choose a type of RoboForm Data to create. 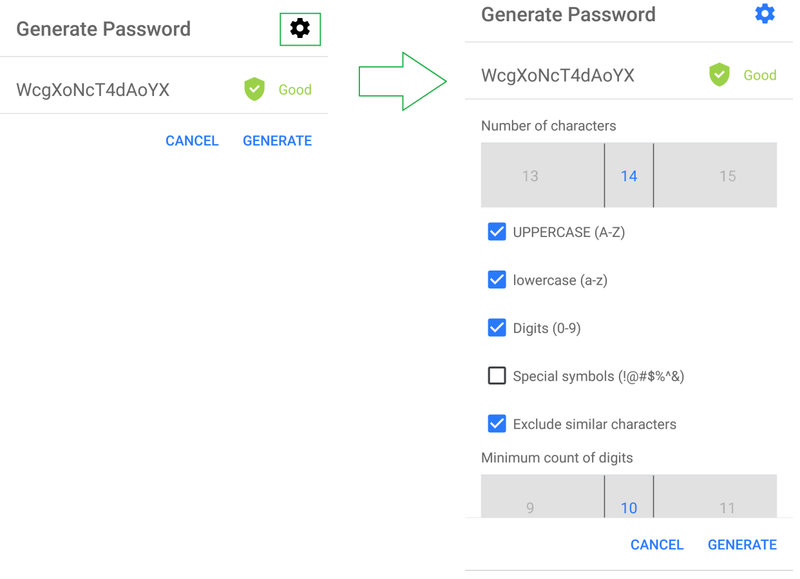 Generate Password allows you to generate a strong, random password when you create an account or change your password. History will show you your search history in the RoboForm Web Browser. Downloads shows anything that you’ve downloaded from the RoboForm Web Browser. Settings opens up the Settings menu. Read more in Chapter 14: Settings. Log Off log out of your RoboForm account. Below the Upper Toolbar, are five tabs of RoboForm Data: Popular, Logins, Safenotes, Identities, and All Items. Select one to open its respective menu. All Items shows all items and folders together. This is a quick-access menu of your Favorite and Most used RoboForm Data. Find the RoboForm Data in it’s menu. Hold down the item until the Options menu appears. Clicking a Login on the Start Page will open its web page and automatically log you in. Show bring up the Edit menu for this Login. Go To navigate to the website for that Login in the RoboForm Web Browser. Remove From Favorites remove this Login from your favorites list. Clicking a Bookmark on this page will open the web page. Go To navigate to the website for that Bookmark in the RoboForm Web Browser. Remove from Favorites remove this Bookmark from your favorites list. The RoboForm Web Browser is a browser built into the RoboForm app that allows the use of your RoboForm data without needing to integrate RoboForm into your mobile browser. Type a Login, website, or search inquiry into Search bar at the top of the page. Select a Login or Bookmark from the Logins Menu or Start Page to open it in the Browser. Select a website from your History to open the website in the Browser. The Search bar allows you to search your RoboForm Data and also acts as the Address Bar for the RoboForm Web Browser. It is located in the Upper Toolbar of the app. Typing in an inquiry will show all RoboForm Items that match your search as well as results from the web, and search engines. Logins will automatically open and log you into the Login’s web page. Bookmarks will automatically open the web page of the Bookmark. Identities will open the Identity in the App. 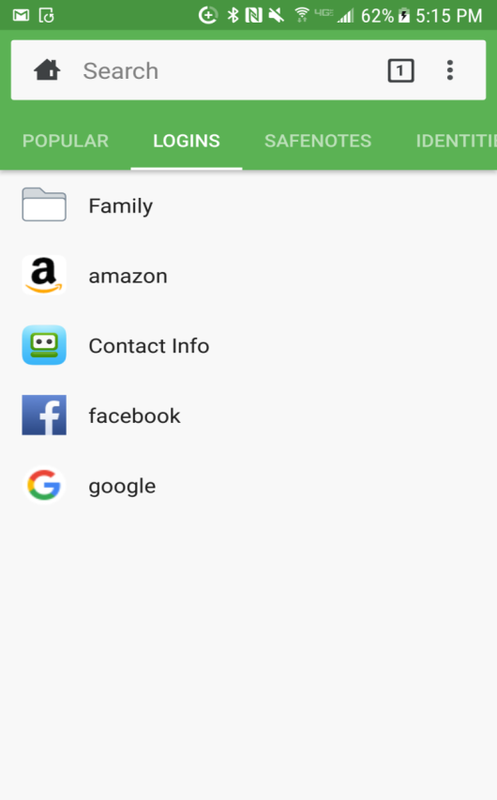 Contacts will open the Contact in the App. 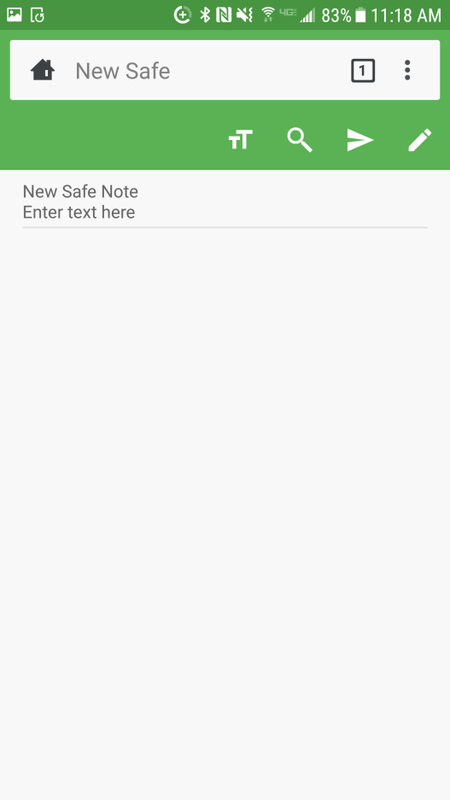 Safenotes will open the Safenote in the App. Clicking a Web term in the search bar will open the web page or search engine in the Browser, similar to an address bar in other browsers. Click the Refresh Button inside the Menu button to the right of the search bar refresh your web page. The Home button will take you back to the Start Page from whatever page you are on. The Menu button opens an options menu, read more in Chapter 8: Start Page. The Tab button allows you to open, close, and pick which tab to use in the RoboForm Web Browser. The + in the top left will open a new tab. The X in the top right corner of a web page will close that tab. Click Page button or tap the tab if you found the tab you would like to use. The Password Generator generates random, unique, and complex passwords in order to increase your cyber security. Open the Password Generator by selecting the Menu button near the top right of the Start Page and select Generate Password. It will automatically generate a password. It will have a shield with the strength of the password (Weak, Good, Strong) to the right of the password. When the password is generated it will automatically be copied to your clipboard. If you would like a different password, click the Generate button at the bottom right of the page. Advanced settings allows you to adjust. The Length of the password. Whether the password contains Uppercase or Lowercase characters. Whether the password contains Numbers. Whether the password contains Special symbols(eg. !, @, #). If it will exclude similar characters which removes similar looking characters. For example: I, l, 1 and O,0. The Minimum count of digits changes the minimum amount of numbers in the password. Click the Generate button to apply your setting changes and generate a new password. The password is copied to your clipboard on creation. 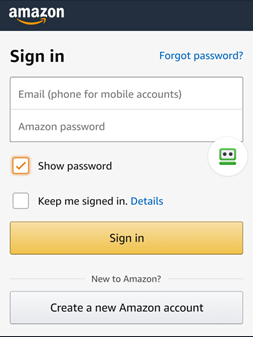 You can now paste it into a new account creation page or change one of your weaker passwords. 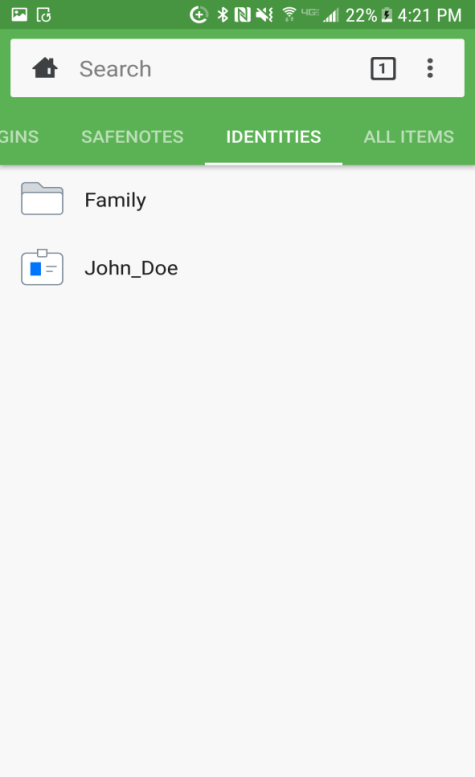 RoboForm Sharing and Sending feature allows you to securely share RoboForm Data (items or folders) with others. Sharing and Sending uses a Public-Private Key Encryption which replaces the risky practice of sharing your Master Password or emailing sensitive data. If your recipient does not have a RoboForm, the recipient will receive an email with instructions on how to create a free RoboForm account. Sharing RoboForm Data will give the recipient access to the data, and any changes (E.g. changing a password) will be reflected in their copy of the data. Access to the shared data can be revoked at any time. The sender may choose multiple recipients. Find the RoboForm Data in All Items or its respective menu (e.g. Logins Menu). Hold down the item, and in the menu that pops up, select Sharing. Click Add. Their email will appear under Who Has Access. If the recipient received and accepted the request, their status will be Accepted. If the recipient hasn’t received the request, their status will be Pending invitation. If they deny the request, their email will be removed from Who Has Access. 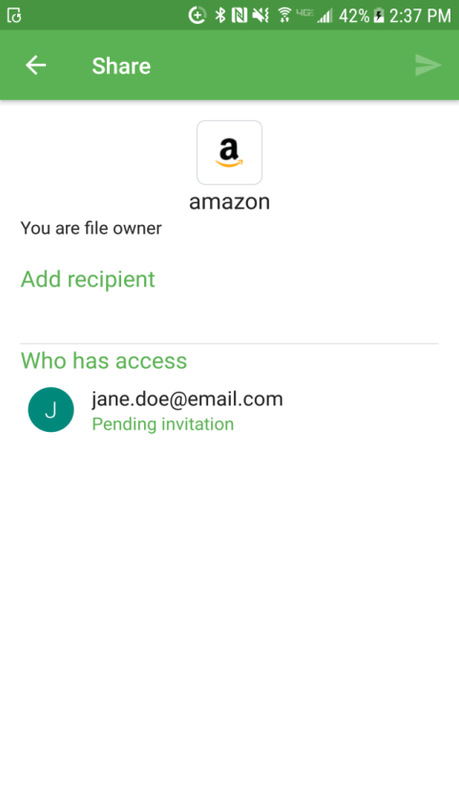 To Revoke Shared Data, press the name of the recipient and select OK. 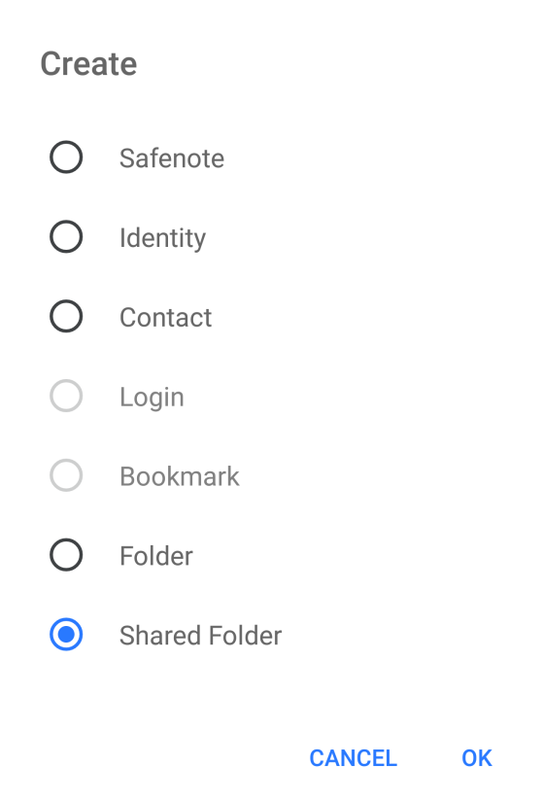 Creating a Shared Folder will let you share multiple RoboForm items with its recipients. Access to the shared folder can be revoked at any time. The sender may choose multiple recipients. Note: Everywhere users can only create one shared folder. Business Users can create multiple. Press the Menu button > Create & Save > Shared Folder. Name your new Shared Folder. Find the RoboForm Item in All Items or its respective menu (e.g. Logins Menu). Hold down the item, and in the menu that pops up, select Move. If your recipient does not have RoboForm, they will be emailed instructions on how to create a free RoboForm account. Select their Role or permission level below the email. The permission levels are explained in detail below. Select Server Only to have the data only be on the server, and not locally on the device. The recipient will be shown under Who Has Access with their email and permission level. If they deny the request, their name will be removed from Who Has Access. Limited: The recipient will not be able to edit or share RoboForm items in the Shared Folder. Logins can only be used to log in to websites, applications, and mobile apps - the passwords cannot be viewed in the Editor. 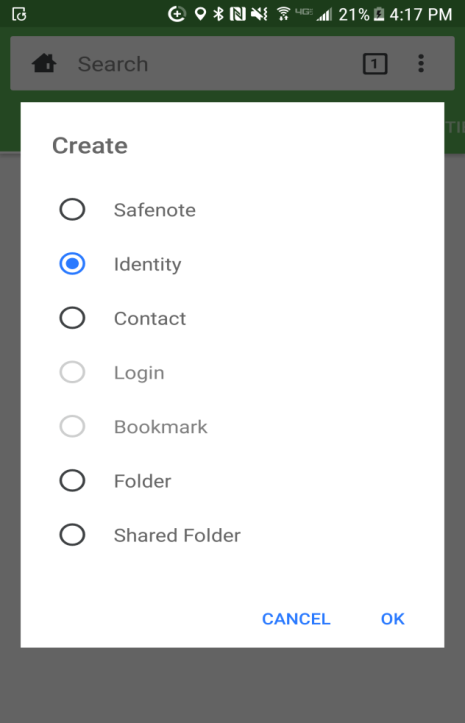 Identities and Safenotes can be viewed in the Editor. 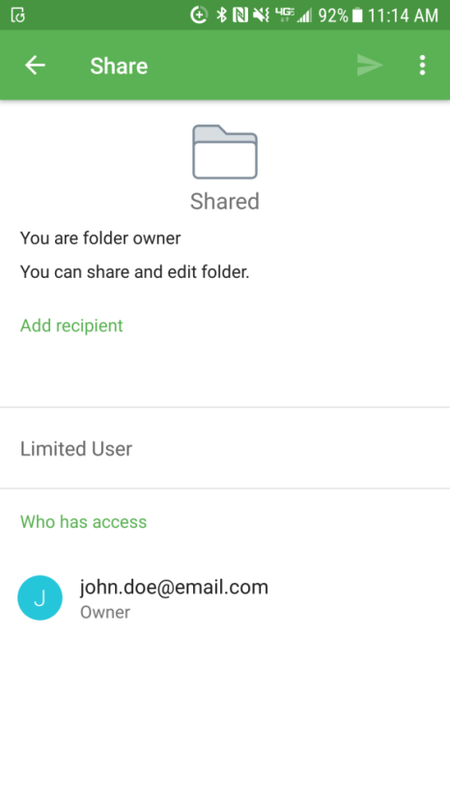 Regular: The recipient can view and edit RoboForm items in the Shared Folder, and the changes they make will be propagated to other recipients and to the sender. Manager: Full access rights. In addition to being able to view and edit all items, the recipient can adjust permission levels, as well as add or remove other recipients (including the original sender). Sending RoboForm Data is similar to sending an email. The RoboForm data is sent once, any changes won’t be updated (E.g. changing a password) to the recipient and access to the sent data can’t be revoked. You can send an item to multiple recipients. Hold down the item, and in the menu that pops up, select Show. The Sent Item will be denoted by a blue icon. If you have received a sent item and accept it, you will find it in All Items or its respective menu (e.g. Logins Menu). The Security Center identifies whether your passwords stored in RoboForm are unique, complex, and randomly generated. It further suggests which of your passwords should be changed and made stronger. Security Center is located in the Tools tab of the Settings menu. Your Security Score is shown at the top of the page. The percentage score, rating (eg: “Good”), and description represent the collective strength of all of your individual passwords. The rating of the Security Score has a range of Bad (0-25%), Average (26-50%), Good (51-75%), and Excellent (76-100%). Below the Security Score there are three tabs that break down your Individual Logins. The tabs with red shields have items lowering the Security Score, while green shields satisfy the Security Score test. The first tab is labeled All. When you open this tab, it will show you all the Logins and identities their Strength Ranking: Weak (red shield), Good (orange shield), or Strong (green shield). 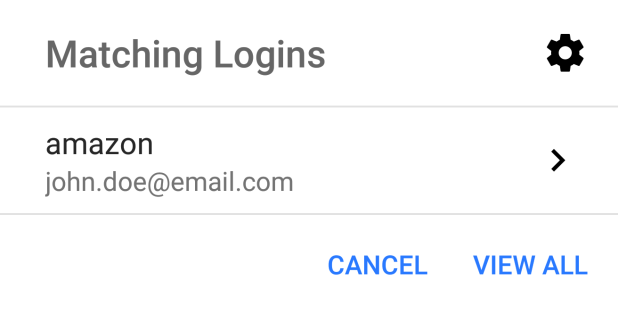 By default, the Weak Logins are listed first. The levels of Password Strength for individual passwords are determined by the zxcvbn algorithm, which is based on entropy or unpredictability. The strength ratings for individual passwords have a range of Bad (0-25%), Average (26-50%), Good (51-75%), and Excellent (75-100%). In order to achieve a Strong Password Strength rating, create a unique and complex password. Clicking on an Individual Password will open the Edit Screen. 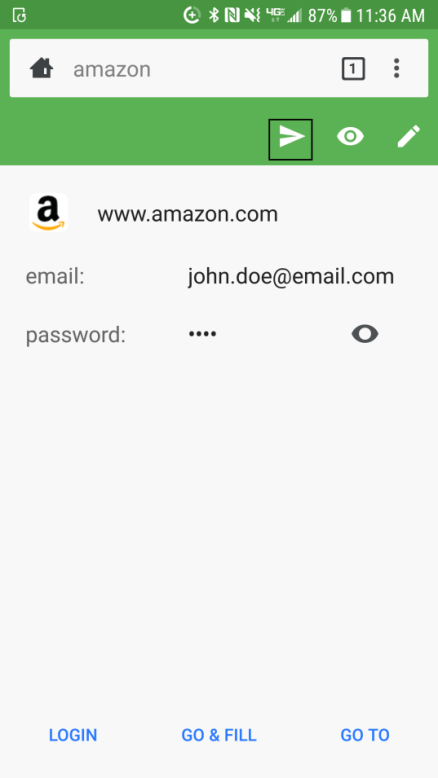 The middle tab is labeled Reused and lists multiple Logins with identical passwords. The number in this tab represents the amount of unique passwords that have been reused for multiple websites. Logins are organized under Groups with Reused Passwords; each Group consists of Logins that share the same password. The last tab on the right is labeled Complete Duplicates and shows Logins with identical usernames and passwords for the same website. The number in this tab represents the amount of username/password combinations that have been saved more than once. 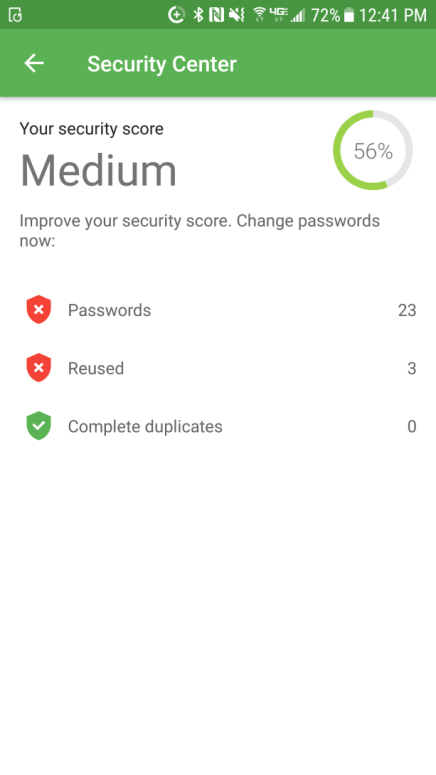 Complete Duplicates do not affect the Security Score, but have their own tab so the user can easily delete Complete Duplicates saved to RoboForm. Log in to a website that has a Weak score. Find the Account or Settings page where you can change your password. Select the Password Generator in your Lower Toolbar. Read more in Chapter 10: Password Generator. Remember to save the newly generated password in RoboForm. Going through this process for all your weak passwords will better secure your information and improve your security score. In case of an emergency, such as incapacitation or death, it could be vital to have a trusted person obtain access to your medical, financial, and other important information. 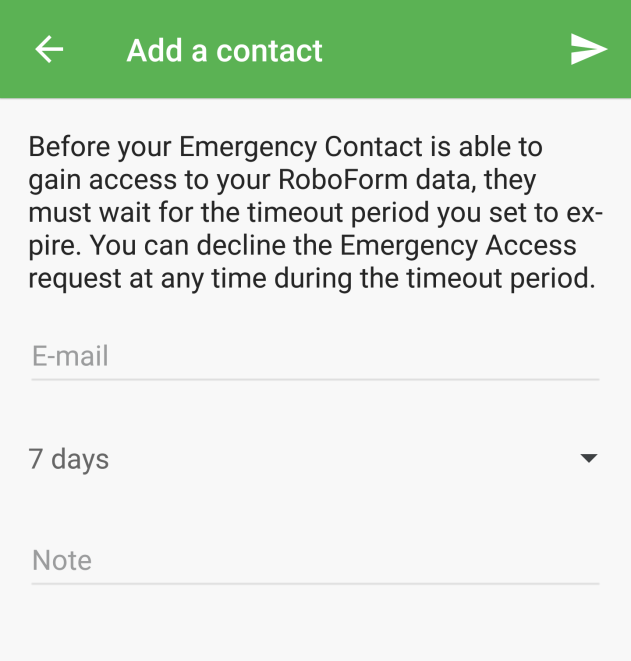 With Emergency Access, you can set up measures for a pre-approved contact to securely receive access to your RoboForm Data after a certain time period passes. Emergency Access uses public-private key encryption, similar to our Sharing and Sending features. This allows for secure access by the recipient without the grantor's Master Password. To open Emergency Access and its settings, select it in the Settings menu. Make sure to set up Emergency Access as soon as possible to ensure you are prepared for an emergency. Setting up Emergency Access is explained below. The grantor of the access will open Emergency Access from the Settings Menu. Click the + in the bottom right corner to create a new Emergency Contact. Type in the email of the recipient of the Emergency Access and select the timeout period for them. The timeout period is how much time has to pass before the recipient can access the grantor’s RoboForm Data. An email will be sent to the recipient. If the recipient's email address has a registered RoboForm account (free or Everywhere), they will receive notification via email of the pending invitation. If the email address provided does not have a registered RoboForm account, the recipient will receive an email with instructions on how to create a free RoboForm account. The recipient can Accept the Emergency Contact invitation in Emergency Access. The Status of the recipient will be shown in Emergency Access. Invited means that the recipient has not responded to the Emergency Contact Invitation. Accepted means that the recipient has accepted the invitation. Rejected means that the recipient has rejected the invitation. The Emergency Access grantor will be notified via email and in Emergency Access if the invited Emergency contact accepted or declined the invitation. Accepted recipients - now, Emergency Contact - can now use Emergency Access. Read how to use it below. Note that the grantor can adjust the timeout period by clicking the Emergency Contact’s name, selecting a new timeout period, and clicking apply. 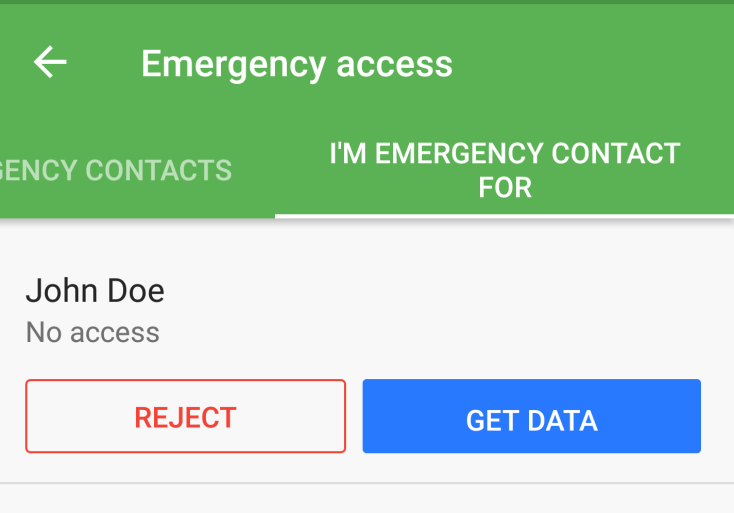 The Emergency Contact will open Emergency Access in the Settings menu. Under I’m Emergency Contact for, there is the option to Request Access to the grantor's RoboForm Data. Requesting access begins the timeout period and sends an email about the request to the grantor. Before the timeout period is over, the grantor now has the option to accept or deny the access request. After access is granted or the timeout period ends, the Emergency Contact can now go to I’m Emergency Contact for. All of the grantor’s RoboForm Data will open in view only mode. 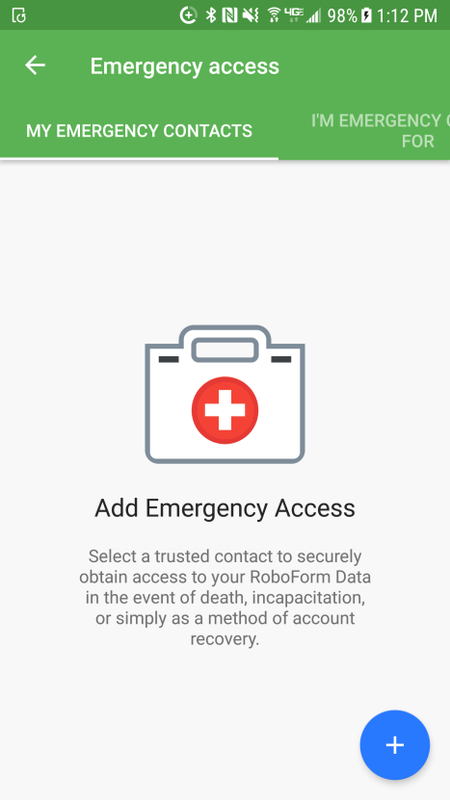 The data is available to download to the Emergency Contact’s RoboForm by selecting the individual Download buttons or the Download All button at the bottom. You can also Search for a RoboForm Item with the search button in the bottom right. The grantor can revoke access at any point. 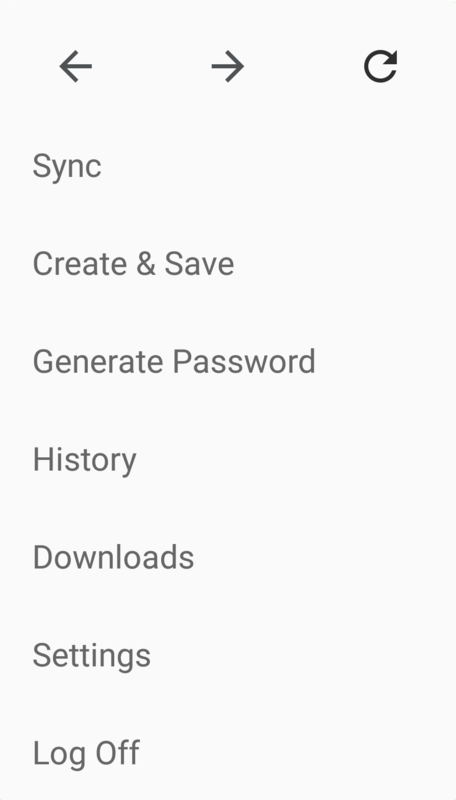 The Settings menu hosts all the settings for RoboForm, as well as functions within the RoboForm app. Find the Settings menu by selecting the Menu button on the Start Page. The next section will go through each tab of the Preference Menu. Lock App On determines how long until the RoboForm App is automatically locked. 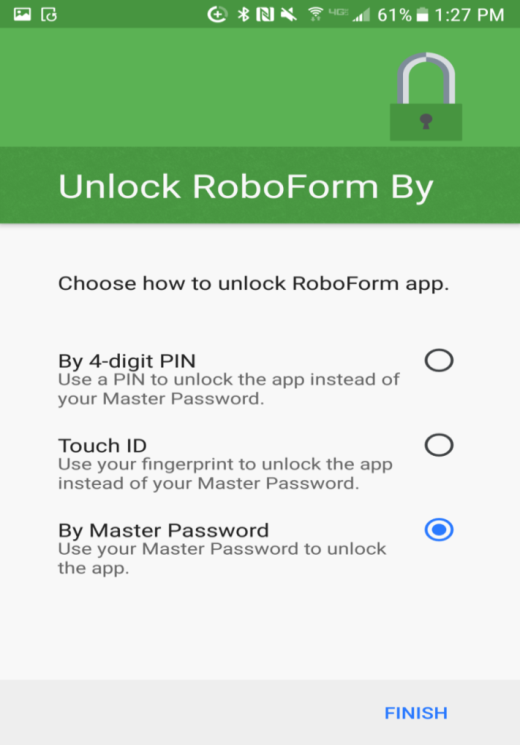 Unlock App By lets you choose between using a 4 digit PIN, Touch ID, or your Master Password to unlock the RoboForm App. Auto-Logoff after if you have chosen to unlock the app with a PIN or Touch ID, this will change the amount of time before you will need to reenter the Master Password to login. Change Master Password allows you to change your Master Password. After clicking it, simply type in your old Master Password and enter your new Master Password twice to change it. It is very important that you memorize your Master Password. Change Sync Account lets you sign into a different RoboForm account. RoboForm Online Account after prompting you for your Master Password it will show you your RoboForm UserID and account password(for version 7 users only). Starting Sync allows you to change whether RoboForm syncs your data automatically. Preview Sync Results if turned on, will show you what changes to your RoboForm data are being synced to the server before the changes are made. Install Firefox add-on will install the RoboForm add-on for Firefox. 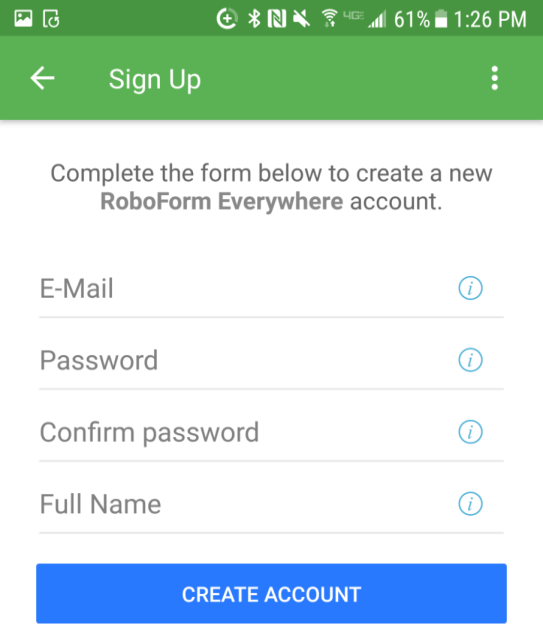 Fill forms in Apps will enable RoboForm to fill forms in other Apps. 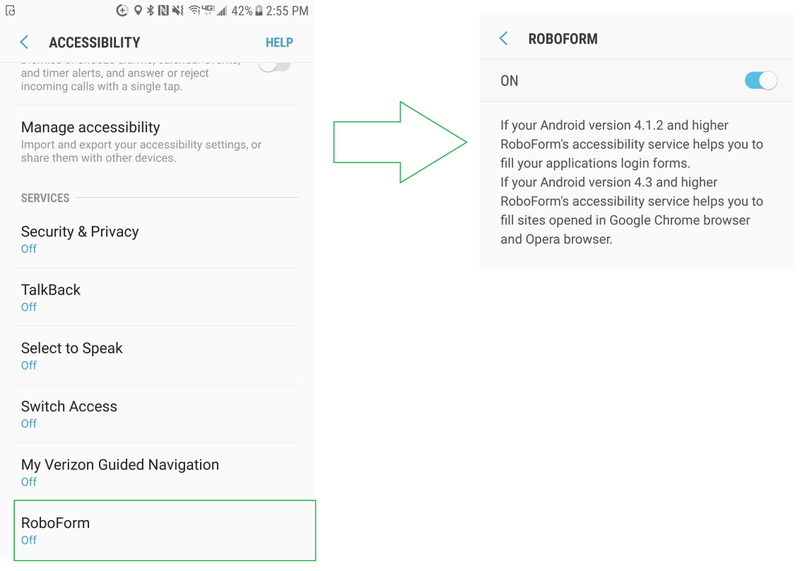 Once you have turned this setting on you will be taken to the Accessibility settings where you will need to enable additional permissions for RoboForm. Search Engine Change which search engine the RoboForm web browser uses by default. Browser Tab Max Count Change the maximum number of tabs the RoboForm web browser can have open. Request Desktop Web page mobile web browsers use a different standard to load web pages. If this option is enabled then RoboForm will use the same standard as desktop computers. Clear Browsing History clear the browsing history for the RoboForm web browser. AutoSave Login Forms if this option is checked then when you login into a website that you don’t already have a login for, RoboForm will offer to save it automatically. 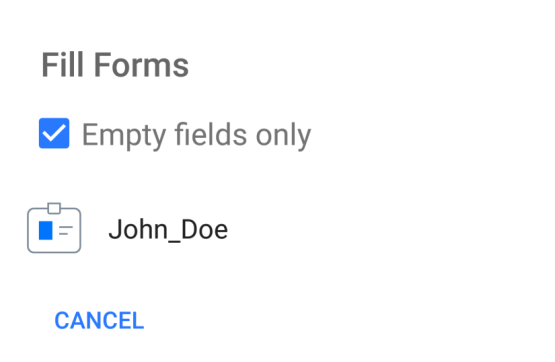 Fill empty fields only if this option is checked then RoboForm won’t attempt to fill in any fields that you’ve already filled. No AutoSave for these sites RoboForm will not offer to save logins for websites that you list here. Some websites utilize the same Logins or Account for different URLs. These are called Mirrors; E.g. Bank of America uses mbna.com, bankofamerica.com, bofa.com, and usecfo.com. Domain Equivalencies simplifies this by creating a single Login for multiple sites. Simply create a New Group and add each individual domain by clicking the “ + ”, e.g. “mbna.com and bankofamerica.com”. These settings will then apply in Matching Logins. Delete a Domain Equivalency by clicking the “ - ”. New RoboForm tab starts on changes what appears when you first create a new tab in the RoboFom web browser. Number of items on Popular page sets the maximum number of items that appear in the Popular tab. Reorder home page items allows you to rearrange the order that your RoboForm data appears in the Popular tab. Show Password as Clear Text in Login if checked, when viewing the password for a RoboForm login it will not be censored by default. 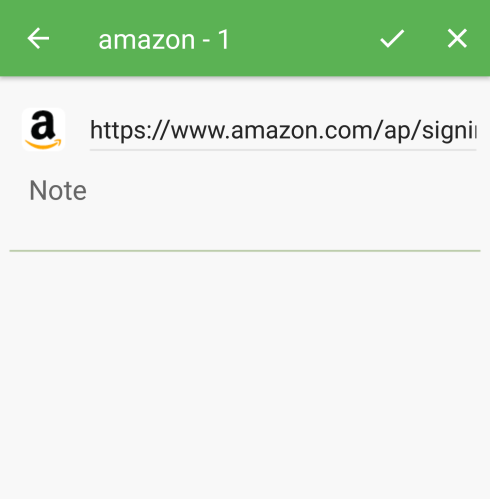 Tap on login action changes the default action when pressing on a login. Flatten folder tree if checked will show all RoboForm data contained in sub folders in the Home folder. Show Logins on a grid if checked, your logins will be displayed in a grid rather than a list. Security center opens the security center. Read more in Chapter 12: Security center. Color theme allows you to make the background of the RoboForm app white or black. Allow to make Screenshots if not checked then you will be unable to take screenshots while in the RoboForm app. Show/Sent Logs will allow you to view the logs generated by the RoboForm app and send them to us in order to assist you with any problems with the app. Opens the Emergency access page. Read more in Chapter 13: Emergency access. Enter the email associated with your RoboForm account. You will be redirected to the settings page. Enter your name and phone number and click Submit. This information will only be used for support purposes. Scroll to the bottom, type your message, and submit your ticket. Click here to directly access the online support system. 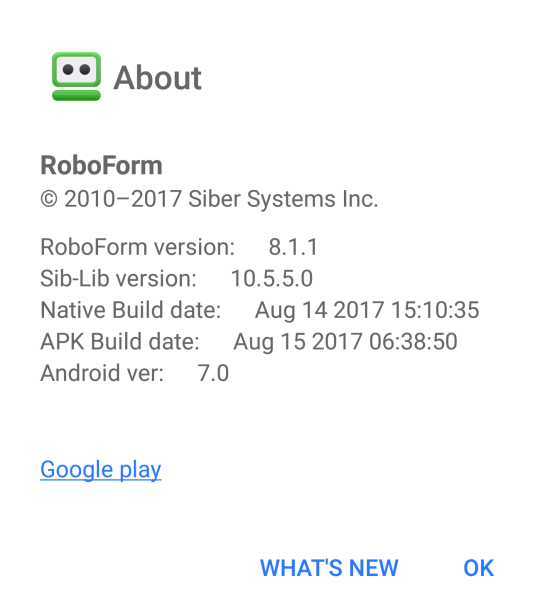 Pressing Google Play will open the Google Play store in the RoboForm web browser and take you to the RoboForm page. Pressing Whats New will open up the most recent changes to the RoboForm app in a new tab in the RoboForm web browser. The RoboForm App is also able to fill and submit forms in other web browsers and apps. If you are in another app that you would like to save or fill a login for simply click on the password field and a RoboForm icon will appear on the screen. 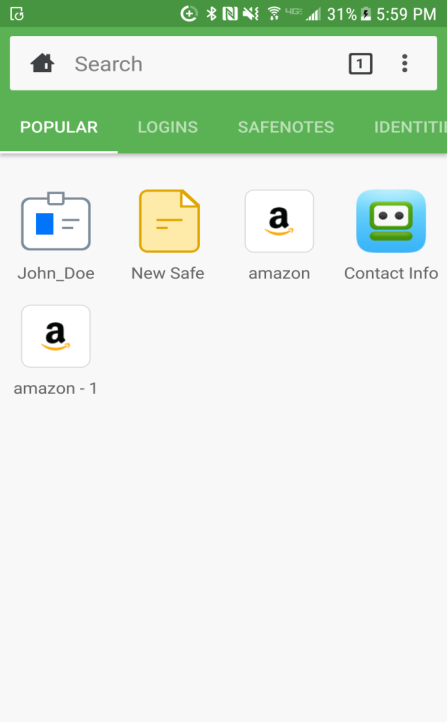 Clicking the RoboForm icon will present you with matching logins for that app. 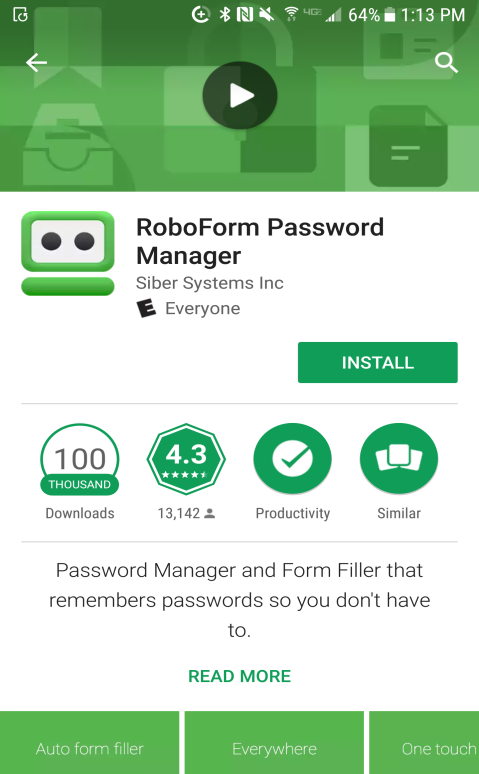 If you would like RoboForm to save a login for the app then simply press the + and RoboForm will offer to save whatever you have entered into the username and password fields as a new login. To enable this feature make sure that Accessibility settings are enabled for RoboForm. Read more in Chapter 14: Settings. 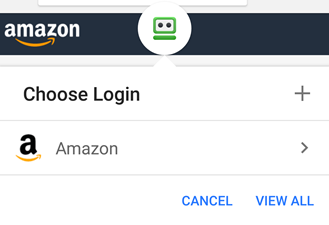 If your web browser is able to add extensions then you can add the RoboForm for Android extension through its extension store. If your web browser does not have the option to add extensions or there isn’t a RoboForm extension for your browser RoboForm will still be able to work with your browser. 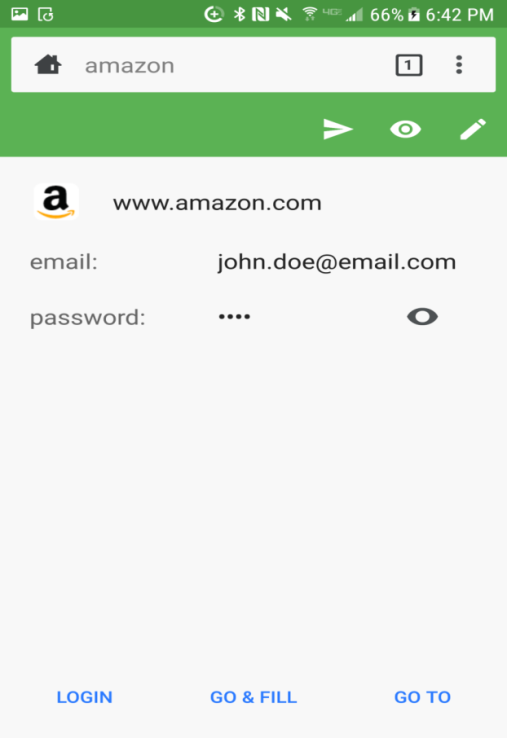 Simply click the password field as if you were using RoboForm in any other app. If the RoboForm extension is installed in your web browser then you will see a RoboForm icon in your address bar. Clicking it will give you the option to save whatever you have entered on the current page as a login or a bookmark. With the extension installed, RoboForm will appear in the options menu of your web browser as well. Clicking it will give you the option to fill in a login for the website you’re currently on. RoboForm Online is covered in the RoboForm Windows Manual which can be found at roboform.com/manual. RoboForm Security is covered in the RoboForm Windows Manual which can be found at roboform.com/manual.